The 325th served in the Mediterranean Theater in WWII as part of the 15th Air Force. Italy during the War was a lot harder to get to than London, if you were a war correspondent. The Checkertail Clan came out of the War with a sterling record......and not a lot of publicity. The 325th Fighter Group documentary project started small...Very small. Neil, already known and respected on the internet as a gifted amateur movie maker had just finished the extremely ambitious "Not My Time to Die" The story of Thunderbolt ace Robert Johnson who's plane was so shot up in one battle he should never have made it home. Projects like this are all-consuming and possibly remembering that somewhere in the house, he had a family, Neil concluded the closing credits with "This is my last film". A close friend, Ralph Gimenez, had other plans. As the story goes, Ralph had just returned from the Gathering of Mustangs and Legends in Columbus, Ohio where he had spent some time with 325th ace Barie Davis. Long a Mediterranean Theater expert, Ralph came away from the Gathering newly acquainted with the Checkertail Clan and with a head full of Barrie's stories. Those of us who know Barrie know the man is no slouch as a story teller. Ralph got in touch with Neil who had just told the world he was done with film making. The rest, as they say, is history. Read Neil Pugh's account here. The film project, as Neil admits, started off as possibly a 10 minute short with lots of computer generated flight sequences and not a lot of talking. As Neil describes, word got around. Pretty soon, people from all over began to get in touch. Including Art Fiedler's massive contribution of photos and mission accounts, that 10 minutes was beginning to seem a little tight. Then came the idea of video interviews. 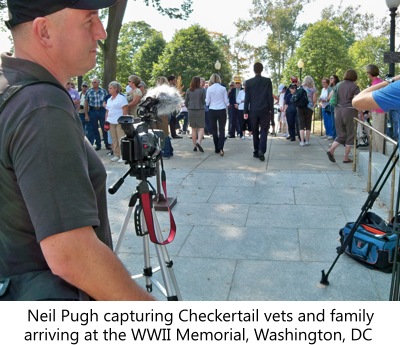 Allready a professional with both camera and video, Neil began to acquire hours of interviews. Film that hadn't seen the light of day in decades surfaced. This writer will never forget the moment, about 4 months into "Checkertails" when Neil took a look at the massive pile of material and said something along the lines of "Good grief...This might have to run 45 minutes!" It didn't stop there. 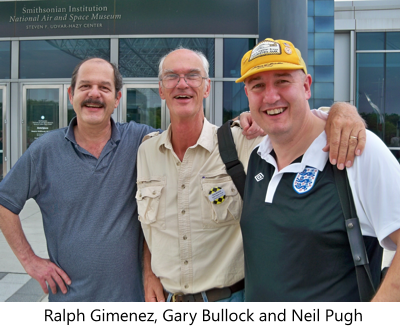 By now, Neil had spent 5 days in the States getting interviews with Jerry Edwards and Jack Sherbourne. Elsewhere, Ralph had organized a squad of "virtual" pilots who could fly in IL2, an online flight simulator that would be used to recreate 325th aerial battles. Gary Bullock came on board. A veteran actor, Gary had been friends with Gordon "Mac" McDaniel. The project now had serious talent. Production, still photography, video, computer graphics....And now, a professional narrator. Three years went by and finally, at the 65th Checkertail Reunion in Washington, DC, "Checkertails Part1, the Legend Begins" premiered to a standing ovation and no small amount of tears. Checkertails Part1 is available free. 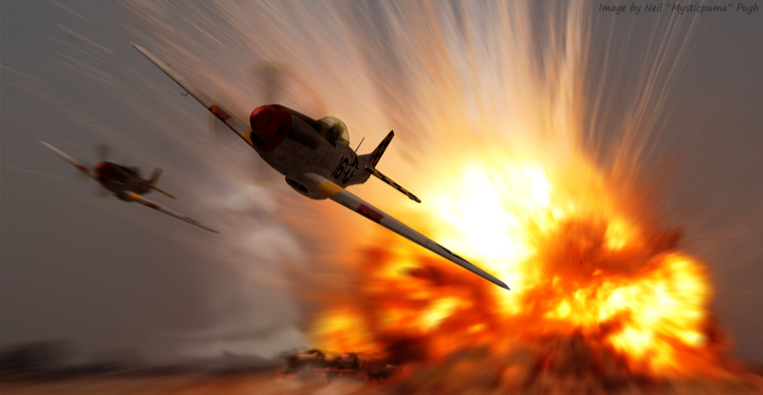 Checkertails Part2 was released November 25th, 2012, and covers the "2nd half of the War", the Mustang era. Here are Neil Pugh's words following Part 2 public release and the end of a nearly 6 year all-volunteer project. Five years on from a late-night conversation with Ralph "Monguse" Gimenez, in which he uttered the now immortal words to me "have you ever heard of 'The Checkertail Clan'?" here is Part 2 of my self-made Documentary on the 325th Fighter Group "The Checkertail Clan"..
Part 1 tells the story of the Fighter Group's formative days from activation, to flying the P-40's and rotation into the P-47 Thunderbolt. Part 2 continues their story, detailing the transfer to P-51 Mustang's and covers the missions flown, the personal stories that affected the men, the anecdotes they recall of their service with the 325th, and all of it told intheir own words. Narrated by Professional actor Gary Bullock this film records the history of those men who served with the Checkertail Clan in World War 2. With never before seen interviews, original archive footage and images (again many never seen before), my journey across the United States has proved to be as rich and fruitful (while also sometimes frustrating) as I could have wished for and I present their story for anyone interested in WW2 history, to view completely for free. This disk has been made for free, I have done it all in my spare time. I have done it for fun but also so that veterans and families (as-well as all of you interested in WW2 History) will have a permanent record for future generations to hear the stories of these great men who served in WW2, in their own voices. All I would ask is that you share the link, DVD, video files with as many people as you can as the whole purpose has been to tell their story and share their knowledge with others. Please understand, every person who helped and is listed in the credits has done so for free, in their own time and all to honour these Veterans. Gary Bullock, knew Gordon McDaniel (a 5-in-a-day Ace) and it was by chance that we hooked up and once he saw what I was doing, he readily jumped onboard with the project and offered to re-write my amateur script and make it what you hear presented in this feature. The film runs for two-hours and thirty-six minutes and covers D-Day, Operation Dragoon, First flights, training, losses of friends, specific missions....the list is endless. I hope you enjoy the feature, and if you do please leave feedback as I hope you can spare me a few moments to pass on your thoughts. One final disclaimer I have to make. I have tried my best to identify Luftwaffe Units taking part in the action during specific events in this feature. Please remember this is the history of the Checkertail Clan, and while I have tried my best to make the Luftwaffe units accurate, I haven't got an unlimited amount of time and so I have just done my best. While much of this feature is related to the Checkertail Victories, it is not exclusive and does cover their losses too. I realise the Luftwaffe did score victories against the 325th, but that is a Luftwaffe story and if someone wants to make their own film, then I await to see that with relish. For now I present Part 2 of my Documentary, thanks for taking the time to either download or watch it online. I would like to thank the Virtual 352nd Fighter Group (especially 352nd_ Persecutor) for hosting the files for the DVD. If anyone is able to download and create a Mirror for the files or a torrent I would be grateful and add them to this post so others can get the files quickly too. Download Parts 1 and 2 here. The files include cover art to fit a DVD jewel case. The Video files can be burned to a DVD and are intended for viewing on a large screen TV.